Completed in 2014, this luxury residential tower includes a restaurant, café, main lobby, tech center, office space and fitness center. 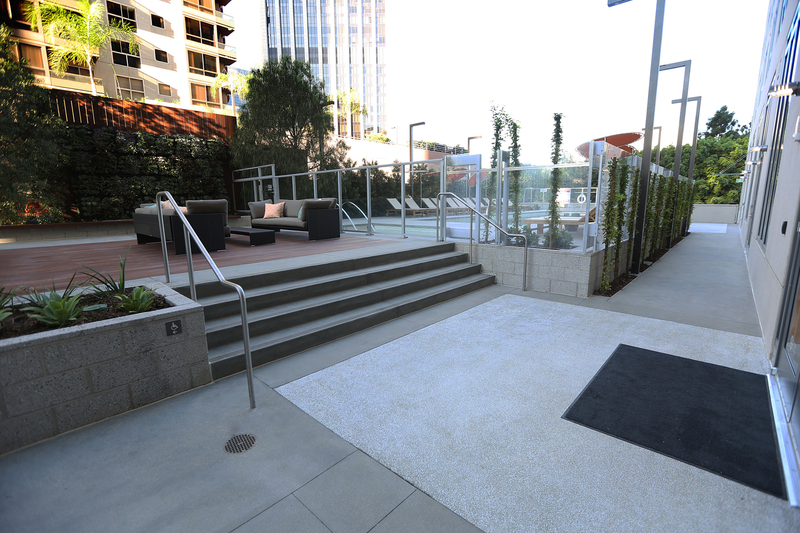 The Bomanite Licensed Contractor, Bomel Construction worked with designers, Rios-Clementi and GC Pankow to provide walkways, paths and outdoor entertaining area with a sophistication that matches the world class architecture. 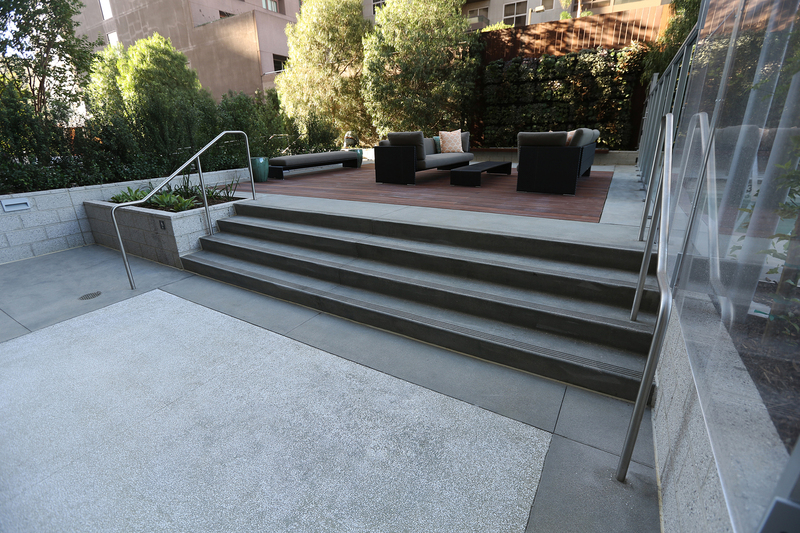 The Bomanite Exposed Aggregate System, Bomanite Revealed was installed in two finishes. One with a white base, beach tint and seeded with mother of pearl shells aggregate and the other with a gray base, black tint and inyo white rock to match the upscale lifestyle. The Emerson brings elegance to downtown LA living and boasts over 250 residential units ranging in size from studios to one- and two-bedroom layouts. The Emerson promotes a warm sense of community within an urban landscape. Rising 20 stories above the epicenter of Los Angeles’ arts and culture scene, The Emerson unifies architecture, exquisite design and a marquee location. Panoramic views of the entire city from residences and amenity spaces create an awe inspiring setting for city living and instill a feeling of connectivity to downtown Los Angeles. 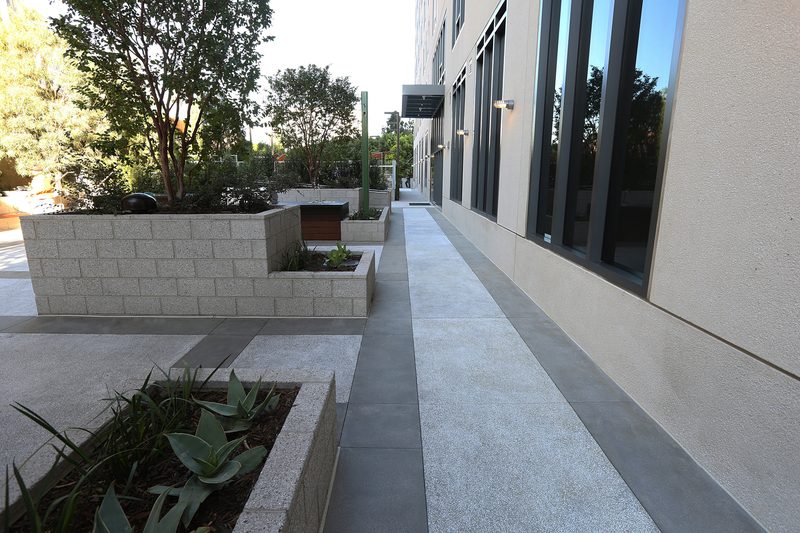 The Bomanite Exposed Aggregate Systems can provide the elegance needed to match the design in color and type of aggregates available, decorative finishes and designed sawcuts revealing just how brilliant concrete can be. 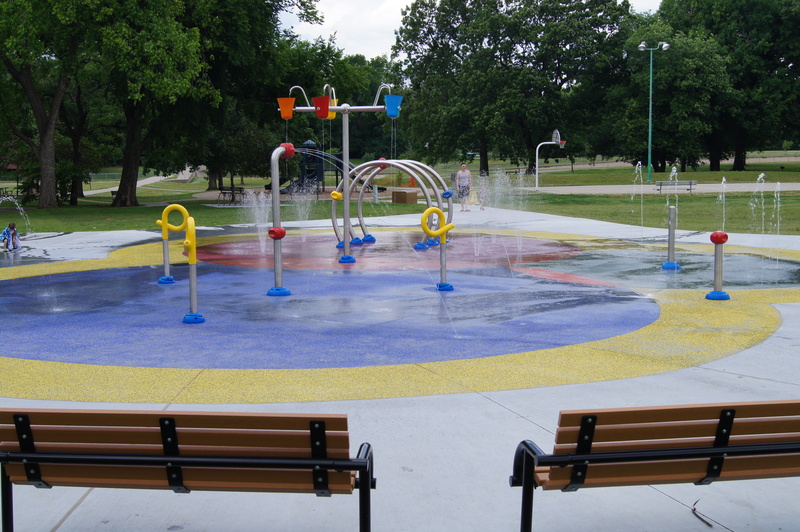 Bomanite of Tulsa, Inc. worked with Alaback Design Associates to specify Bomanite Revealed Exposed Aggregate System to produce a slip resistant surface for a splash pad on the City of Tulsa, Parks Department project Manion Park. 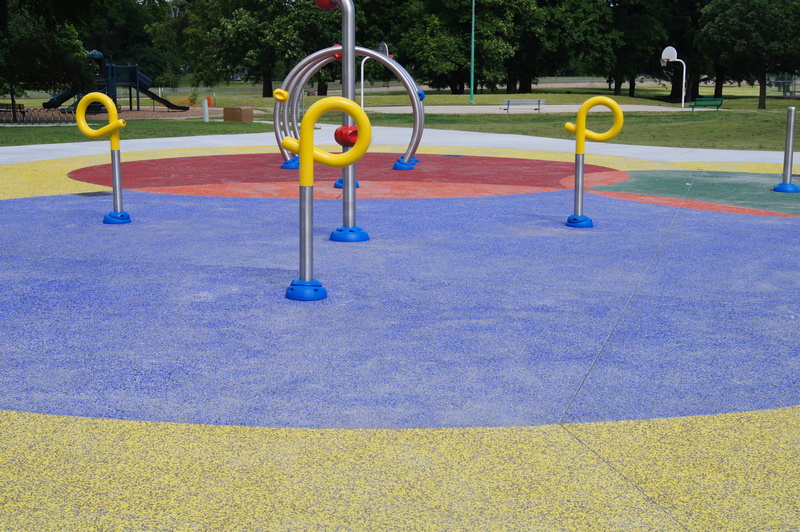 Manion Park Splash pad used recycled glass as the aggregate to produce the vibrant paving option that offered excellent slip resistance for kids on the playground. 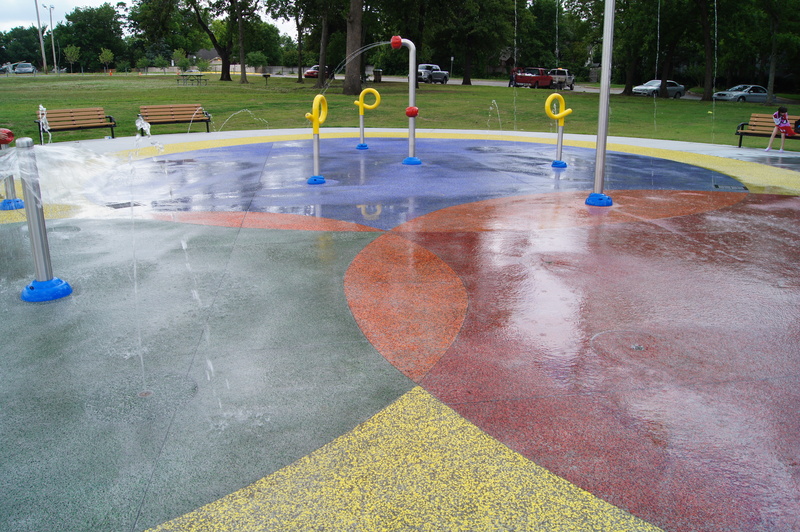 Saw-cuts where placed between colors to produce a clean break point for each color on the 2,800 SF splash pad. Bomanite Revealed is an architectural exposed concrete with varying exposure depths using decorative aggregates that are bond in a unique binder and apply to plastic concrete. The Bomanite Revealed System utilizes pre-blended binders, light fast pigments, topical treatments and advanced application procedures to produce a finished product that showcases the seeded aggregate. 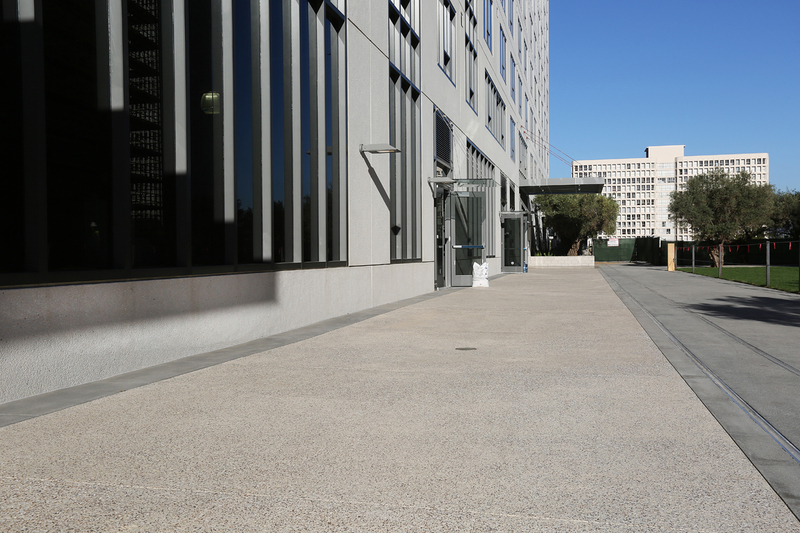 Unlike most surface seeded installations, Bomanite Revealed provides 100% exposure of the decorative aggregate with no native sands detracting from the finished appearance. The final product is unique alternate to other decorative concrete finishes while producing a monolithic concrete slab with a low life cycle cost due to the pre-aged nature of the surface. Bomanite Revealed is suited for exterior applications—anywhere that improved wear resistance for light to moderate-duty vehicular or foot traffic combined with an architectural finish is necessary.